"I wrote Toward Tomorrow to bring attention to this crisis." Jacqueline Ko, co-founder of Opera Mariposa and creator of Toward Tomorrow. Photo courtesy of Opera Mariposa. This month Vancouver’s Opera Mariposa, a company “run by young artists, for young artists”, presents Toward Tomorrow, a something-for-everyone event with a great cause. 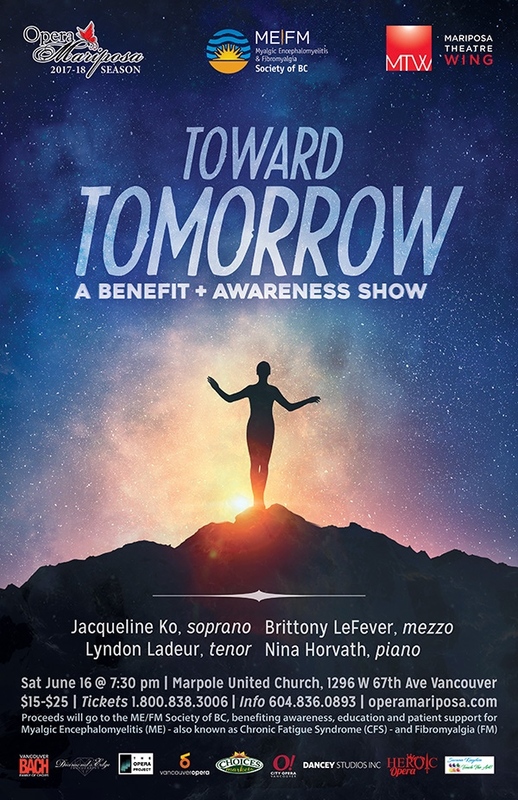 Opera Mariposa co-founder Jacqueline Ko wrote Toward Tomorrow as a way to raise awareness for Myalgic Encephalomyelitis (often referred to as Chronic Fatigue Syndrome), a disease from which she has suffered since the age of six. Jacqueline Ko, co-founder of Opera Mariposa. Since starting Opera Mariposa, Ko’s performances have raised over $50,000 in support of treatment, education, and research of chronic neuroimmune disease. Toward Tomorrow happens June 16, 7:30pm, at Vancouver’s Marpole United Church, and it combines operatic arias from The Magic Flute and L’elisir d’amore, Broadway hits from Hamilton and West Side Story, and more. Ko will be joined by mezzo-soprano Brittony LeFever, tenor Lyndon Ladeur, and pianist Nina Horvath. Plus, the show includes a dessert buffet, and a raffle contest. Tickets start at $15, and you can find more details right here.